Packed with heart-healthy vegetables and smothered in a surprisingly low-fat cream sauce, our Cream Spinach Lasagna is a hit among carnivores and vegetarians alike. Although we’re unabashed carnivores in our family, some of our best friends don’t eat any meat. So I’m constantly looking for new recipes that I can add to my repertoire that are hearty and tempting, whether you’re a vegetarian or not. I was thrilled when this Creamy Spinach Lasagna was a big hit among all my friends when I served it at a recent gathering. Filled with heart-healthy vegetables and a surprisingly low-fat béchamel (cream sauce), this lasagna delivers layers of yummy goodness for everyone that eats it. This is best prepared when you have plenty of time on your hands, though, as the multi-step process is somewhat involved and it has a long cook time. But don’t let that prevent you from preparing it! Simply assemble the lasagna, then pop it in the oven, set the timer, and catch up on household chores, watch some shows on your DVR, or enjoy our latest book club pick while it bakes to delicious, bubbly perfection. Preheat oven to 375°F with rack in middle position. Spread 1 cup béchamel along the bottom of a 9- x 13-inch baking dish. Place one-third of noodles over béchamel in a single, overlapping layer. 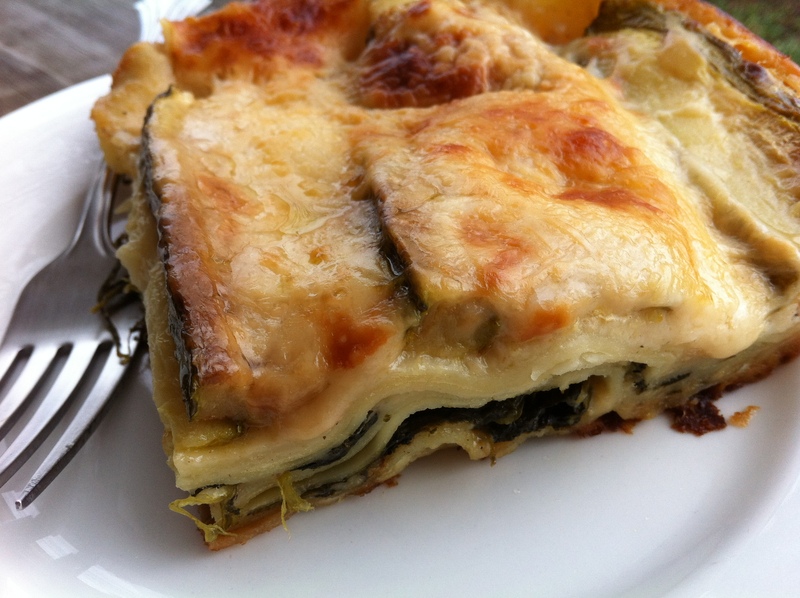 Top with 1 cup béchamel and half of spinach. Repeat with a second layer of noodles, béchamel, and spinach. Top with remaining noodles, remaining béchamel, zucchini, mozzarella, and Pecorino Romano. Cover with foil and bake 45 minutes. Remove foil and continue baking until cheese is golden in places and lasagna is bubbling along the edges, about 15 minutes. TIPS: This lasagna may be made a day ahead and stored in the refrigerator overnight. Before serving, bring lasagna back to room temperature before putting it back in the oven at 375°F and cooking until warmed through, about 15 minutes. Serve with a tossed salad and crusty herb bread for a complete meal. Named after its originator, Louis, Marquis de Béchamel, steward to Louis XIV of France, this dish is prepared with chopped spinach and a creamy sauce for maximum deliciousness. When we prepare meat entrées, we usually serve them with two side dishes, including starches like potatoes, pasta or yuca, and a leafy vegetable for added nutrition. (A good rule of thumb when planning balanced meals is to always try to include something green on the plate.) With this recipe, we turn ordinary spinach into melt-in-your-mouth deliciousness by adding a béchamel sauce, which is a white sauce seasoned with onion and nutmeg and named after its originator, Louis, Marquis de Béchamel, who was the steward of Louis XIV of France. Steam the spinach in a large pot for 2 to 4 minutes, until the leaves have all collapsed. The water clinging to the leaves will be enough to cook it. Drain, cool, and squeeze out the liquid in a strainer. Coarsely chop the spinach. To make the béchamel, heat a sauté pan over medium heat, and then melt the butter and sauté the onions until transparent. Whisk in the flour. Cook, stirring, for 1 minute. Whisk in the milk until fully incorporated and simmer for 30 seconds. Stir in the salt, pepper, and nutmeg. 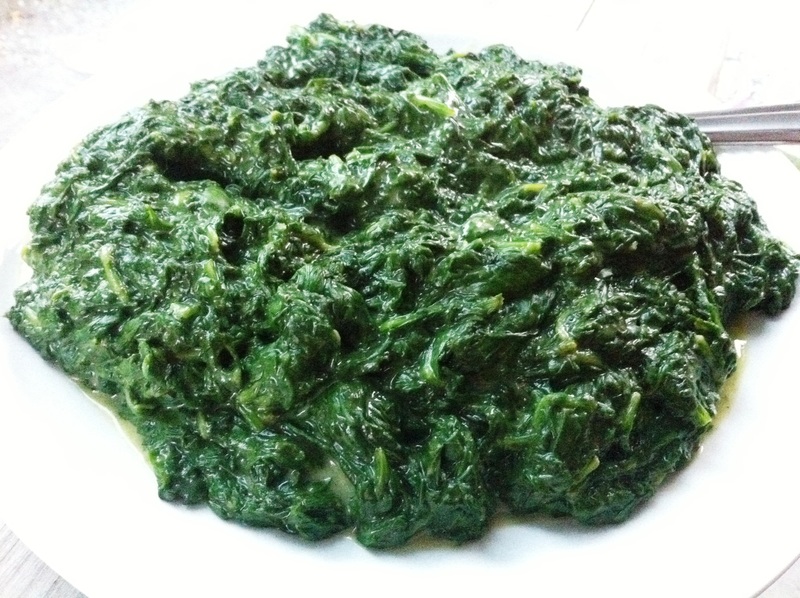 Fold in the spinach and serve immediately. TIP: The spinach can be steamed in advanced and folded in with the béchamel at the last minute, just to heat it through.